Entrance with the ticket for the castle. The Rupnik Piano Trio consists of violinist Manca Rupnik (1996), a third-year student at the Mozarteum University in Salzburg in the class of Professor Rainer Schmidt and, earlier, Professor Igor Ozim, cellist Nejc Rupnik (2000), a third-year student at the Ljubljana Music and Ballet Conservatory in the class of Professor Karmen Pečar Koritnik, and pianist Anže Rupnik (1998), a first-year student at the Academy of Music in Ljubljana, in the class of Professor Tatjana Ognjanovič. All three musicians are multiple winners of national and international competitions. They began working together under the guidance of Kaja Stražar and Urša Kržič at Vrhnika Music School. 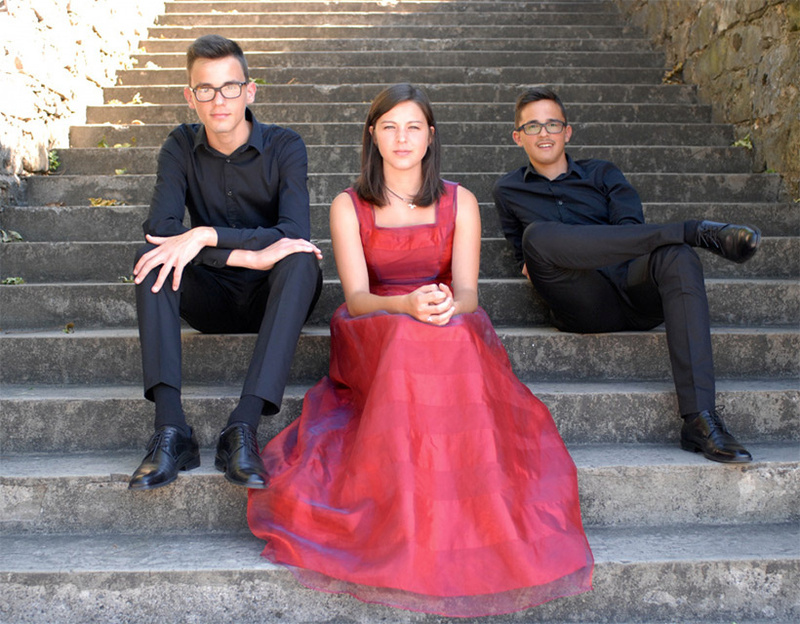 From 2013 to 2016 the trio worked at the Ljubljana Music and Ballet Conservatory under Professor Tomaž Lorenz, and since autumn 2017 they have been playing under the auspices of the Academy of Music, Ljubljana, under the tutelage of Professor Janez Podlesek. The Rupnik Trio has participated in numerous national and international competitions. At their first international competition "Festival Gudaća 2011” in Sremska Mitrovica in May 2011 they were awarded first prize (100 points) and laureate, and in December 2011 they won another first prize and 100 points at the international competition "Paolo Spincich” in Trieste. In May 2012 their performance at the international "Stringfest” competition in Sremska Mitrovica received first prize and 100 points. In April 2013 the trio was awarded a golden plaque and special award at the international music competition "Svirel” in Štanjel. In March 2014 the trio won the golden plaque, first prize and 100 points at the national music competition TEMSIG. In December 2015 the musicians were awarded first prize and a recording opportunity with the Slovenian Radio and Television at the 5th Primož Ramovš Competition of Slovenian instrumental chamber bands. In April 2016 the trio received 100 points at the 8th "Svirel” competition in Goriška brda and became the golden finalist. In March 2017 the trio won the golden plaque, first prize, 100 points and a special award for the best performance at the TEMSIG music competition. The Rupnik Trio also holds the Škerjanc Award of the Ljubljana Music and Ballet Conservatory for outstanding study results and efforts in the artistic promotion of the school for the year 2015. The trio regularly performs in Slovenia and abroad. In December 2013 they made a performance in the framework of the cycle "Music Sundays at Hotel Union with Professor Lorenz” in Grand Hotel Union's Blue Salon. In April 2014 the musicians held a solo concert at Festival Ljubljana's International Music Cycle Young Virtuosi and a concert in Rome. In April 2015 the Rupnik Trio performed as part of Glasbena mladina ljubljanska's cycle "Dobimo se na Magistratu” (Meeting at the Townhall), in July at Festival Bled’s evening of the Russian music for a piano trio at Grand Hotel Toplice, in September at Gewerkenegg Castle in Idrija at the "Gallus Festa 2015” and in October at the cycle "La domenica a Duino” in Devino, Italy. In April 2016 the trio had a solo concert at the Imago Sloveniae in memory of the brothers Primož and Tomaž Lorenz in the Red Hall of Ljubljana’s Town Hall and in July at the Ljubljana City Museum. In September 2016 the trio played at the Festival Vrhnika concert in Vrhnika and in October at the opening concert of Festival Ljubljana's International Music Cycle Young Virtuosi at the Križanke Knight’s Hall. In April 2017 the trio played at the "Korotan” Slovenian Cultural Center in Vienna, in November 2017 they had a solo concert at the Celje Music School, and at the beginning of December they performed at Glasbena mladina ljubljanska’s cycle "At the piano” in the Osterc Hall of the Slovenian Philharmonic. At the end of December the trio were guests of Darja Korez Korenčan at the traditional pre-New Year gathering at the Krka Gallery. Nejc Rupnik plays a cello by luthier Katharina Abbühl (2011), Manca Rupnik plays the "Sub spirito" violin (1999) made by Cremona-based luthiers Alessandro Crillovi and Katharina Abbühl.